No one would ever suspect that such a cute animal could be so vicious. Cannibalism among hamsters is not only an aggressive issue, it may also be a survival instinct. As a responsible pet owner, it's up to you to know which hamsters can be cannibalistic and how to properly house hamsters to avoid the risks. Depending on the species, hamsters may be cannibalistic because they're territorial. For example, Syrian hamsters can be aggressive toward other hamsters and, in some cases, they'll kill and eat the other hamster in the cage. Mother hamsters whose pups are stillborn or die after birth have also been known to eat their babies. The cause remains unknown, but it may be a form of protection. In the wild, the smell of a dead pup would attract predators, something the mother can't risk. Another cause can be overcrowding. Syrian and dwarf hamsters are known to be cannibalistic against other hamsters in the habitat. While dwarf hamsters can sometimes get along with cage mates, they can also become aggressive. Robo hamsters thrive in colonies, but they must have enough space or they too can become cannibalistic due to overcrowding. In this case, the Robos will kill the young to protect the older members of the colony from starvation. This can apply to dwarf hamsters as well. Robo hamsters are the safest to house together because they truly enjoy the company of other Robos. However, you must provide enough space and food so the colony doesn't fight. A 10-gallon tank should be provided for a pair of Robos. Robos that enjoy each others company will eat, play and sleep together. If the pair seems standoffish from each other, you should house them separately. Buying a pair together will help prevent any unease between the two. 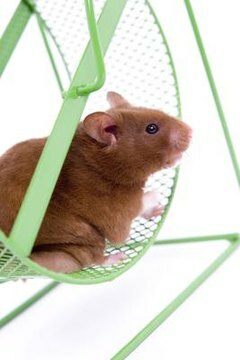 You never want to house several hamsters in the same cage, no matter what breed you choose or how large the habitat is. For example, when housing Robos together, avoid housing more than three pairs together and choose a 20- to 30-gallon tank for their habitat. You can also protect the colony by providing multiple toys, burrows, feeding dishes and water bottles. This helps ensure the animals don't fight. Lastly, always keep an eye on your hamsters during the first few weeks to ensure the hamsters are getting along. If any hamsters seem to be sitting alone, they may not be a good fit for the colony and will need to be rehoused. Hammys World: Why Does My Hamster Eat Her Pups? Can You Mix Different Rodents in the Same Cage?